The future is now with streaming TV content! New, comprehensive, and inexpensive streaming services offering paid TV channels become available every day—alternatives to the cable company. FairlawnGig’s fast fiber Internet service is tailor-made for streaming. Get everything from live sports, on-demand entertainment and paid TV channels without being tethered to a cable company. Pay for only the type of content you watch, with a lower monthly bill. Internet streaming services work well with FairlawnGig and in future newsletters, we’ll feature many to help you make a decision on which is best for your household. 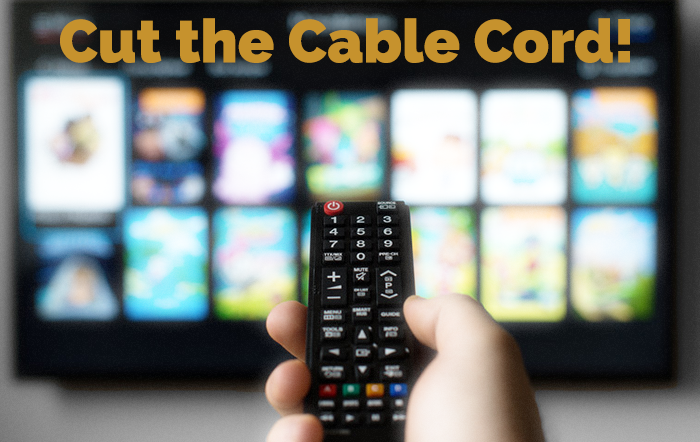 FairlawnGig does not endorse any particular streaming service but is providing this information to help you travel down the cutting the cable cord road as you move from cable to FairlawnGig Internet service. Here’s an overview of Sling TV, an Internet-delivered streaming subscription service that is a viable alternative to cable and satellite TV. There are no long term contracts or hidden fees and you can try it for free for a week. Sling TV offers live content from ESPN, TNT, CNN and more. There are “Extras” to fit your interests. If you’re a sports fan, there are packages with every sporting event you can imagine. Have kids? Get all the programming your children might want. Want on-demand movies? There’s an option for that. Sling’s three packages give you access to watch sports at home or on mobile devices with the WatchESPN app, a great feature for avid sports fans. Starting at only $20/month, Sling TV’s plans match many cable TV packages. With increased competition in the streaming service market, Sling TV has improved and tweaked its channel offering. It’s easy to set up and you pay month-to-month. FairlawnGig’s speed allows you to watch your programs without buffering, exactly how you’d experience it with cable. We recommend the Residential Premium or Gigabit Plan for the best viewing experience. Sling works with just about any streaming device like Amazon Fire TV, Roku, Apple TV (2015 version and newer), many Smart TVs, mobile devices and both Mac and PC computers. You won’t need that bulky cable box: use the streaming box or Smart TV you already have. Sling is currently offering deals on streaming boxes; at this writing, you can get Apple TV for $89, half off a Roku Premiere or a free Roku Express. Get live coverage on ESPN, TBS, CNN and more. While you can’t record events, you can pause, rewind, and fast-forward live content. A nifty feature is the Three-Day Replay. While it isn’t available on every channel, it is on most. Watch the last three days’ full schedule. This is a way to shed cable TV’s DVR leash. Movie channels’ on-demand libraries allows you to watch a show you may have missed. With Sling Extras like HBO ($15/month), Cinemax ($10/month) and Starz ($9/month) you can access their complete libraries any time you please: both current and past shows and movies. In December 2016, Sling offered a cloud DVR beta program to customers with Roku devices, which uses the cloud and not a traditional DVR. Look for expansion of this feature to other streaming devices and Smart TVs, as Sling aims to crush the cable market’s stranglehold on DVR service. You can add Extras to Sling TV packages by choosing categories that offer multiple channels; everything from children’s programming to most sports for as little as $5/month to start. By picking your preferred Sling Extras, you can get over 100 channels for far less than what you would pay to get the same content on cable. You can get your local channels with an antenna, which we covered here. Watch Sling TV at home and anywhere with Wi-Fi. FairlawnGig’s Wi-Fi is the fastest available in Northeast Ohio. You choose where, and how, you watch your favorite shows. Sling TV works on just about every available mobile device. Who will benefit: viewers who have had basic cable and watch national sports on ESPN; if you want flexibility in your channels choices and don’t want to be saddled with a large cable bill for channels you never watch; if streaming on one device at a time works for your household. Who will benefit: if you want channel flexibility but more than the Orange package includes. Watch sports on the WatchESPN app (this package doesn’t offer watching ESPN directly from Sling TV). Sling Blue lets you stream on three devices simultaneously. Who will benefit: viewers who want all the channels in the Orange and Blue packages. Sports Extra ($10/month): includes NFL RedZone, Golf Channel and more. Lifestyle Plus Extra ($5/month): ten channels for $5, including E!, Cooking Channel, FYI, and more. Kids Extra, Comedy Plus Extra, Hollywood Extra, News Extra and World Cricket Extra ($5/month). News Extra ($15/month): CNBC, MSNBC, BBC World News and more. Movies and premium shows: HBO ($15/month); Cinemax ($10/month) and Starz ($9/month). Hollywood Extra ($5/month): movie channels from TCM, EPIX, SundanceTV, and others. World News Extra ($5/month): BBC World News, HLN, MSNBC, and seven other channels. Many cable companies charge you over $200/month for basic channels and premiums like HBO. But even if you’re only paying $100/month, in five years with cable, you’d be paying at least $1,200. For the same channel line-up on the Sling Blue + Orange package with HBO ($55/month): that would come in at just $660 over five years. An interesting fact about Sling TV is that it is owned by the satellite company DISH, which shows you that streaming is here and how TV is going to be delivered in the future. Sling TV’s lineup is constantly being added to, so visit their website to see if this would be a good fit for your household. Have you signed up for FairlawnGig Internet service? Please fill out our sign-up form here or call a sales specialist at 330–668-3300.